Experience TRUE SAILING aboard classic sailing yacht Jakab! Enjoy a sail aboard Sailing Yacht Jakab! 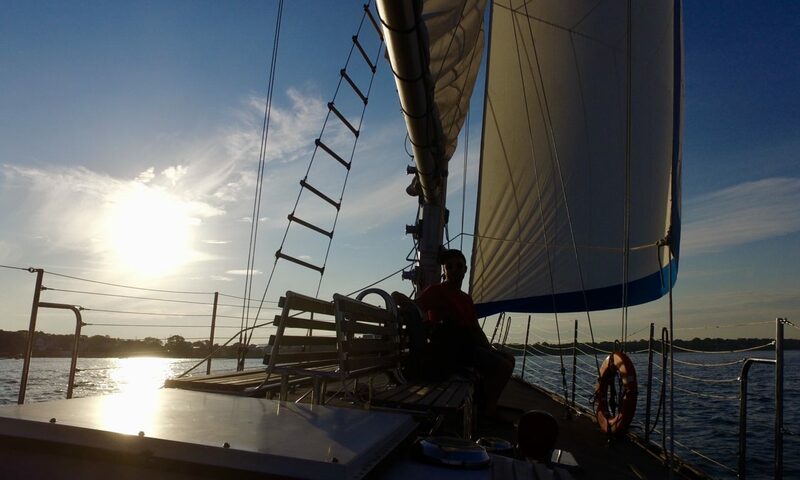 Enjoy a majestic true sailing experience aboard JAKAB, an elegant 55-foot, 40-passenger traditional sailing yacht offering affordable Private Events and Public Sails from Port Washington’s beautiful harbor. Rates start at $25 per guest. JAKAB is an exceptional yabht. One of her sisterships, “Tourjours Ete”, was owned by musical group “The Beach Boys” – and includes a Jacuzzi tub, piano and 16-track recording studio. Another sistership, “Eros”, circumnavigated the globe twice. Another sistership was owned by former Senator Teddy Kennedy. Other sisterships are sailing the three major oceans. Jakab is a vintage sailing yacht whose timeless design is based upon the magnificent America’s Cup J-Boat racing sloops of the late-1920’s. Jakab’s mast initially belonged to Prime Minister Sir Edward Heath of Great Britain. When Sir Heath retired from racing he sold the mast to the former owner of JAKAB. Nearby attractions include Port Exploreum, 1860 Light Station, Possibility Playground, Coal Dock Park, Duluth Trading Company, Twisted Willow Restaurant, Newport Shores Restaurant, Tellos Grill & Café, Yummy Bones BBQ, Daily Baking Company, Vines to Cellars Winery, Sir James Pub, Schooner Pub, Critic’s Corner Pub, and R&R Bar and Grill. Come sail with us from mid-May through early-October. The Captain reserves the sole right to reschedule a sail, up to time of departure, should in his/her professional opinion there be inclement weather.